One of the more noteworthy qualities of the martini, the quality that sets it apart from all the other drinks mixed at your local watering hole, is the disproportionate effect it’s had in inspiring witticisms. Dorothy Parker, as usual, leads the way, with this bit of light poetry: “I like to have a martini/Two at the very most/Three, I’m under the table/Four, I’m under the host.” James Thurber added, “One martini is all right, two is too many, and three is not enough.” Winston Churchill has a good one (maybe apocryphally) attributed to him, too: “Martinis are like breasts: One is not enough and three is too many.” Sure, whiskey may dominate country music, but the martini owns the bon mot. Granted, all of those quotes are more than fifty years old. But even yet martinis are being ordered, quaffed, and (sometimes) regretted. You, yourself, may have ordered one recently, and if you have, you have no doubt noticed that it’s a drink that does not come without cost: at my local bar, a standard martini goes for $8. That’s not an insignificant bit of money, but if you adhere to the wisdom of Parker, Thurber, et al, then not a bank-breaker. But were the martinis they referenced, the ones that could leave you under the host (or really anyone, between you and me) the same martinis that we drink now? And after we adjust for inflation, will we find that they cost more now — or less? When we speak of martinis, we are of course speaking of gin. I know this and you know this. To be on the safe side, I polled friends, acquaintances and strangers, all employed in the cocktail-mixing and associated industries, and the responses were emphatic — martinis equals gin. “A martini made with vodka is a vodka martini, which is in many martini drinkers’ eyes not a Martini,” said one respondent, a journalist who sometimes writes about food. And even the sole professional polled that admitted to preferring vodka martinis, a bartender in North Brooklyn, says that he “respects the old hardline Martinis are gin! that lots of old timers hold onto.” We will circle back to the vodka martini, but for our immediate purposes: Martinis are gin. Old-timers represent. Fortunately, gin is fascinating. It’s about 800 years old, and it was first distilled in the Low Countries of Holland, Belgium, etc. It was first known as jenever, which is Dutch for juniper, as it was the juniper berries that gave it the distinctive taste. At the time, it was wine or brandy “cooked” with juniper, which were thought to have positive medicinal effect. By the 17th century, grain spirits were being used to make jenever instead of wine, although the product (Anglicized into genever, or simply Geneva) resembled more of a whiskey in flavor than the clear, floral gin to which we’re accustomed. At about the same time, the Dutch East India Company came into prominence (and by prominence we mean prominence, as for a while the Dutch East India Company was basically one of the most powerful governments in the world), which meant that the local genever was being shipped all across the globe. The key to the first wave of popularity of gin? Distribution. Gin as we know it now is a product of English ingenuity, or at least the English willingness to advance adult beverage science. As the Dutch East India Company circled the globe, “strong water” houses were popular in Britain, selling to customers aqua vitae (i.e., hooch). While the rise of popularity of gin (an abbreviation of the Anglicization) may be difficult to divine in hindsight, there is one obvious proximate cause: the Glorious Revolution. In 1688, William of Orange, a Protestant gin-drinker from Holland, overthrew King James II, whereupon gin became the modish libation to demonstrate fealty to the crown. Blue Ruin, Ladies’ Delight, Cuckold’s Comfort. The sobriquets for the eighteenth-century drug of choice were legion. Never before had England been so mesmerized by a beverage; never again would the city of London be as consistently intoxicated as it was between 1720 and 1751. Eventually, of course, the British sobered up (to some extent), but they had vigorously embraced gin, and modified the recipe to London dry gin, which is most likely the gin of your martini. It’s a distilled grain spirit, flavored with a large variety of botanicals and herbals, the most prominent of which is, of course, juniper, which is the source of the “icky” that some find in the spirit. This is the reason why gin is rarely drunk straight up, and is largely taken with tonic, or with vermouth. This brings us to the martini, which is a relatively recent invention (compared to gin itself). Let’s not even pretend that we don’t all know a bit more about cocktails than we did five or ten years ago — we are in the middle of a period of obsessive attention to all things foodie, be they the shoes of the horse that carried your heirloom tomatoes, or the mysterious origins of gussying up booze with additional ingredients, hand-crafted ice and oddly-shaped glasses. If you have sleeve garters that you slip on at home when filling the cocktail shaker, you can skip past this. But for the benefit of those who take drink and have been up to now incurious, the story behind martinis goes something like this. The martini may have been invented in Martinez, California, during the Gold Rush, and then transported to San Francisco by a prospector who remembered the recipe of the “Martinez Special.” The martini may have sprang into being at the Knickerbocker Hotel in New York, whipped up by a recent immigrant by the name of Martini. The martini may have been invented by the father of the cocktail, “Professor” Jerry Thomas, a mid-Nineteenth Century mixologist who published the first recipe in his 1862 bartender’s manual, The Bon Vivant’s Companion, or, How To Mix Drinks. It’s a matter of some conjecture, and bickering (as is whether or not “martini” should be capitalized). The martini is not, however, derived from Martini & Rossi, the vermouth and sparkling wine company. But here’s what a martini is: a bunch of gin, a bit of vermouth and/or bitters or other flavoring agent, chilled, and served with a garnish of a twist of lemon (later, maybe an olive). The martini was very popular during Prohibition, as gin was easy to make surreptitiously (such as in the bathtub), and the vermouth was useful in masking the terrible taste of gin that’s been made in the bathtub. And it’s about this time that the martini began to become an idée fixe. See, for example, this early scene from the first Thin Man movie (1934), as we’re introduced to William Powell as Nick Charles, instructing gathered barmen in the proprieties of shaking a martini. And we can start to discuss the price of martinis here. In 1936, at the Globe Copper Cocktail Lounge (not the bar that Nick Charles was in, FYI) in Los Angeles, you could order a Dry Martini for 25 cents. Adjusting that for inflation as we do, we arrive at the 2012 price of $4.14. And, hopefully, you got to see a movie star or two. We again find the quarter martini a couple years later, in Chicago of 1940, at Gimbel’s Restaurant and Cocktail Lounge, on a block of West Randolph Street not far from the Cook County Court House and Grant Park. Above the bar was a motto, “LIVE — LAUGH- LOVE — THE MUMMIES HAVEN’T HAD ANY FUN FOR 3000 YEARS.” Mummies! Twenty-five cents then translates into $4.11 now. Martinis had moved by that point from refreshment to obsession. Yes, the martini may be the province of the witticism, but it is also a volatile topic. While the recipe may be basically simple (two liquors and a garnish), the exacting preparations, the ratio of the gin to the vermouth and the identify of the garnish in question are not easy things for two people to agree upon, now as then. Which is why, in the volumes written about the martini, the subject of the recipe for the Ideal Martini is either the main theme, or at least referenced. This makes, of course, for some fun reading, but it can get a little overwrought, especially when the Ideal Martini, as everyone knows, is the one that you’re thinking of in your own head. I think the best place to start is somewhere in between the pre-prohibition Martini/Martinez and today’s dry gin Martini. Stir the gin, vermouth and bitters for 30 seconds in a mixing glass with ice. Strain into a chilled cocktail glass and garnish with a twist of lemon. You better cut that twist over the drink, too. We’ll give you a second to give that a shot. 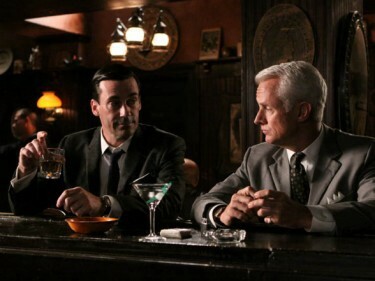 The highlighted presence of the martini continued through the 50s and into the 60s, as WW2 vets became the Middle Class, and then the Man in the Grey Flannel suit became the height of career aspirations. At the Barbizon Plaza Hotel on Central Park South in Manhattan in 1950, a martini (along with all other cocktails and aperitifs) went for 60¢, or $5.73 converted. It’s a martini that cannot be had now, as the Barbizon Plaza is now a bunch of condos known as the Trump Parc. If there’s anyone that is antithetical to the appeal and savoir-faire of the martini, it may well be The Donald. But it was not just a Madison Avenue/Levittown thing. In 1966 at the historic Court of the Two Sisters, a New Orleans landmark in the heart of the French Quarter, if you were the type to bypass their signature Mint Julep and opt for the martini, the barman would probably do you the service of only making fun of you behind your back. And that would be a dandy martini nonetheless, and it would set you back $.95, which would be $6.75 now. While there can be no doubt that pinstripe suits and four-door sedans and plastic credit cards have never won the overwhelming approval of the present younger generation, no symbol of middle-class corruption stands our so blatantly or provokes more wrath in our junior citizens than the All-American Martini. An incurable and not so old Martini-fancier myself who also happens to enjoy part-time college teaching, I’ve been in key positions over the past decade to witness this age group’s brutal attack on the country’s most classic cocktail. The popularity of the All-American Martini was waning, although Villas makes the point that while the martini as a symbol was losing favor, martinis were still the eminent cocktail order at such Manhattan hotspots as Friday’s and Maxwell’s Plum. The martini had adapted, you see, as a decades-long publicity campaign by manufacturers of vodka had resulted in the displacement of the gin in the martini. Vodka was being marketed as flavorless and odorless, thus appealing to those turned off by the unique flavor of gin, and to those in a position to fear the trace of cocktail being detected on the breath. Perhaps when you think of martinis you think of James Bond? Well, you should not, as that is a vodka martini (and don’t think that the vodka companies were not thrilled by Sean Connery/”shaken not stirred”). Villas also did us the service of giving us a price for comparison, as he wrote, in support of the premise of the quiet endurance of the martini, “In airplanes: miniature bottles in plastic racks full of so-and-so company’s Martinis selling like hot cakes at a buck and a half.” That converts into a cool $7.00 now. And for purposes of further comparison, in 1976 diners in San Francisco could stop by the iconic Tadich Grill (now 160 years old!) and start with a Dry Martini for a mere $.90. That’s $3.64 now, and a total bargain. By the 80s, the martini is in full wane. In fact, in reviewing the menus available from the various digital collections, it’s rare to see the martini listed, or even a list of cocktails, while wine lists abound. Diet fads were zinging back and forth across the country, and that coupled with the fact that California could actually grow wine grapes nearly killed the martini deader than a rotary phone. But we did find at least one restaurant, a joint with a view on Highway One in Big Sur, called Nepenthe, that was vending the martini in 1987. For this non-heart healthy cocktail, within a three hours’ drive of Berkeley and the empire slowly being built by Alice Waters. 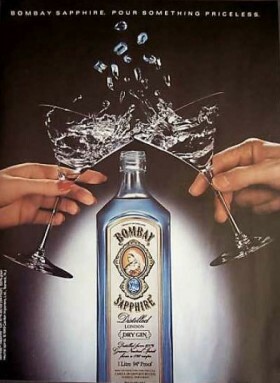 However, 1987 is also the year that gin (and martinis) began a resurgence, with the introduction of Bombay Sapphire London Dry Gin, which is a good gin, to be fair, but was launched with the marketing savvy of an iPhone, with an extensive print campaign of ads featuring only the sleekly designed bottle, with that cool blue color that seemingly doesn’t occur in nature. Gin, and the martini, were again a status symbol, and without irony — gin had attained luxury branding. By 1995, the resurgence of the martini is in full blossom. Take, for example, the Depot in Torrance, California, located, aptly in a railway depot. They were for sure selling martinis, dude, and the “classic” cost $4.00 (or $6.04 now). But there is a reason that the martini had to be segregated as the “classic,” as listed right next to it on the menu are similar cocktails, something fruited, something Cajun, similarly served in the iconic martini glass but not martinis at all. It was the advent of the Martini Bar. It was a dark time. One taste of the chocalatini, or the bananatini, or the smoretini, or any word other than “mart” jammed onto the “-tini,” and you understand. And even though the trend swept the entire adult beverage industry, it was from the start most at home in establishments with names like Reminiscences or Mingles. Oh sure, it was a great period for froofy concoctions — and who doesn’t love a little froof? — but it was an embarrassment to the martini. It’s my theory — a guess, rather — that Martini drinking skipped a generation after Vietnam and marijuana came along. Many thousands of earlier suburban children, admitted to the dinner table or watching their parent’s parties from the next room, saw and heard the downside of the ritual — the raised voices and lowered control — and vowed to abandon the cocktail hour when they grew up. Some of them still blame Martinis for their parents’ divorces. Not until their children arrived and came of age did the slim glass and the delectable lift of the drink reassert itself, and carry us back to the beginning of this story. By the 2000s, we’re learning at least one important lesson: not so many restaurants put cocktails on their menus anymore, and those that do are not listing martinis, or are listing an array of “From Our Bar” without listing the price. A small research problem. So we are going to go with the memory of the author, who is pretty certain that, in 2005, at the restaurant adjoining the hotel on the weekend of his wedding in Adamstown, Pennsylvania, the Black Horse, the martini he ordered after his rehearsal dinner was six American dollars. (Which martini was olives up, and not one of the ten or twenty monkeyed-up chimeras offered.) Believe it or not, that converts to $7.07 today. And now we’re back to now, which we’re familiar with, because we’re soaking in it. To recap recent history, cocktails have exploded, and now, while everyone may have a confused idea of what speakeasies were actually like, they at least know what “bespoke” means. We are hopefully on the downhill side of the Speakeasy Movement, but we are at least grateful that, in between the kitsch and the chintz and the exaggerated effort, the barman watching himself in the mirror as he slowly shakes the shaker a fixed number of times, there are some pretty good honest martinis out there to be had. This looks like (with the exception of the Tadich Grill in 1976) a straight march upwards, a basic doubling in the price of a martini in the past eighty years. Of course there are many variables that make this less than scientific — these are different restaurants, some fancier, some less so, in different parts of the country, so it would be fair to expect some statistical looseness. But overall, it seems that our martini is more dear now than it ever has been. But do keep this in mind: the serving size of the martini has been slowly swelling. 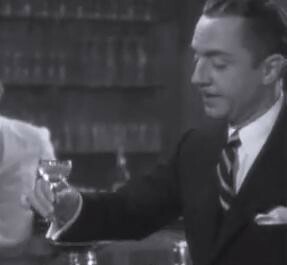 Look at “The Thin Man” footage, and notice that the glasses the martinis are served in seem comically small. 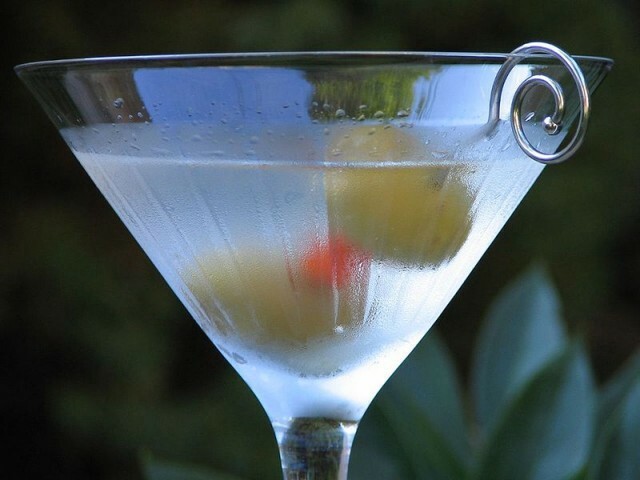 Originally (and in Mikos’ recipe above), a martini was three ounces of fluid. And if you think back, or make a quick run down to your local T.G.I. Fridays, you will note that the normal (gargantuan) glasses popularly used now are big enough for a squirrel to take a bath in — sometimes six ounces or more. So the argument could be made that the price of the Martini per ounce has actually held pretty steady after all this time. The section of DeVoto’s manifesto, noted above, is entitled “The Cocktail Hour: Do’s and Dont’s.” It ends with this bit of wisdom: “Remember always the three abominations are: (1) rum, (2) any other sweet drink, and (3) any mixed drink except one made of gin and dry vermouth in the ratio I have given.” We wouldn’t go so far as to nominate abominations of our own, as the appletini is technically “any mixed drink except…” So we will politely agree. Brent Cox is all over the Internet. Top photo by Ken30684.